I had a heck of a time filming my forecast today…Murphy’s Law was in full force: anything that COULD go wrong did indeed go wrong. So, unfortunately the video forecast will not be posted tonight, but I’m hoping tomorrow will end up being a better day for filming! After all the active, stormy weather we’ve experienced the past few weeks, we are finally going to settle in a very pleasant pattern…however we have to fight through a bit of stubborn cloud cover to get there! Lows tonight will be in the low to mid 30s under partly to mostly cloudy skies so watch out for slick spots tomorrow. Places like Seabeck could very well brush the freezing mark. Skies will be mostly cloudy. Tomorrow will be mostly cloudy as well with more sunshine the further south you go. 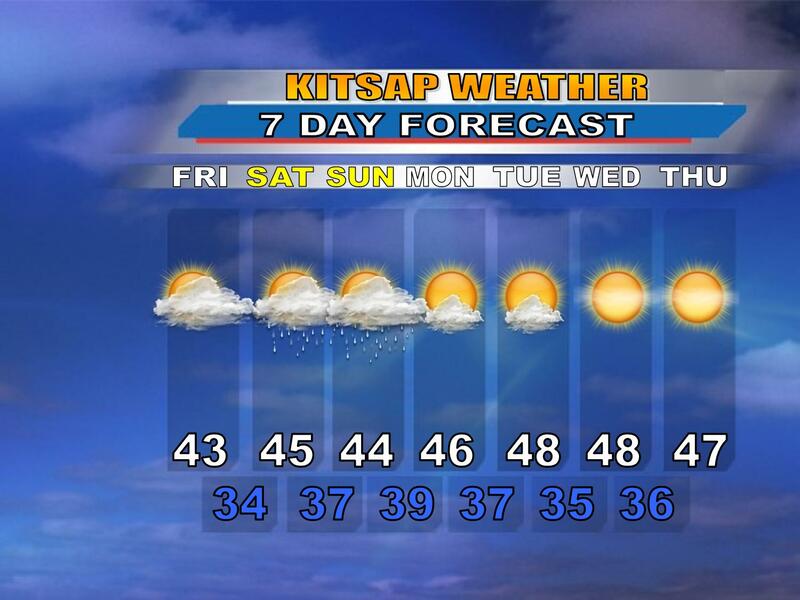 Highs will be in the low to mid 40s so noticeably cooler than the past few days! Light rain returns for our weekend, but a beautiful pattern sets up for next week and beyond with seasonable highs in the mid to upper 40s and lows in the 30s. We may have some fog problems, but right now that looks to be a minor problem. So, granted technology doesn’t betray me again, I’ll talk about some precipitation totals from around the central sound regarding this past storm tomorrow. There are some reports of flooding in the Lake Stetson/Seabeck area but overall the Central and Northern Kitsap Peninsula came out of this storm relatively unscathed thanks to the Olympic Rain Shadow which helped us out the past few days (I did a post on how the rain shadow works a few entries down if you’re interested). South Kitsap was hit much harder than Central and North Kitsap, as predicted, and the reason why there have been reports of mudslides/road closures in North Mason/South Kitsap areas is because the rain shadow didn’t affect them in the same way. 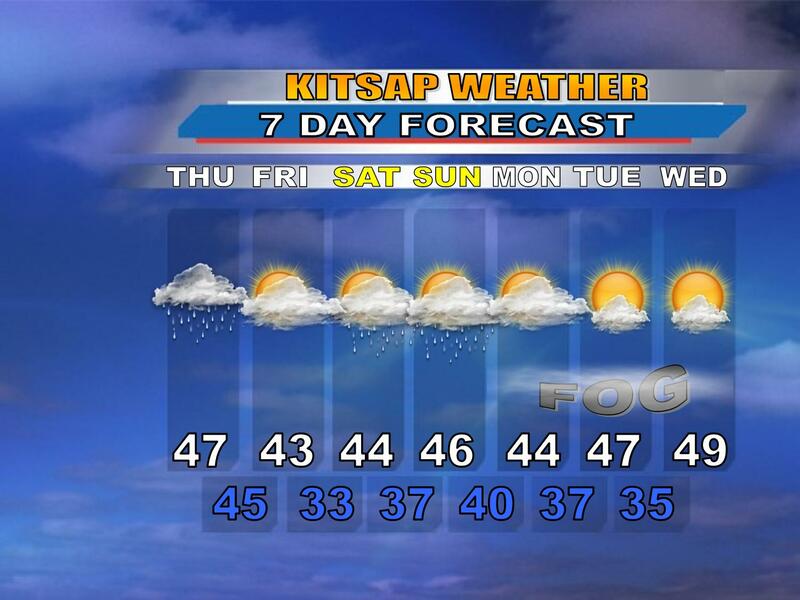 For updated information on the trouble spots in Kitsap, click here. As you can see, Kitsap missed the worst of it! For the rest of the day, expect partly to mostly cloudy skies with light rain showers over the area. Ahhhh 🙂 Take it in Kitsap, take it in. It’ll be a welcomely calm day after such an active one yesterday. Now here’s where it gets interesting (don’t you love it when the weatherman says that?). Tonight the skies clear and much colder air filters into the area, dropping overnight lows close to freezing, if not at freezing so we could be talking about VERY slick conditions tomorrow morning. Clouds will increase tomorrow causing mostly cloudy skies, but dry weather will continue through the day with the next frontal system moving in on Saturday, offering nothing more than clouds and typical light rain. This pattern will likely last until late Monday. Highs during this period will be cooler in the low to mid 40s. Then, as if sent from above, a nice big ridge should set shop over the area delivering some areas of morning fog but afternoon sunshine with seasonable highs in the mid and upper 40s. I will be filming a video forecast every other day (except on weekends…) for this blog, so I’ll be sure to post it this evening.